You may have seen my previous posts about Strong Hearts Vegan Power. You may have also seen the countless pictures I’ve posted on various social media sites. I think it’s obvious that I love this team and everything it stands for. Over the past 2 years I have made many lifetime friends and enjoyed awesome adventures with my teammates. We’ve spread the positive word about veganism and have gained a lot of recognition and attention as we show that we’re not only compassionate, driven individuals – we also thrive athletically. So you can only imagine how awesome it is to see our network grow. Here is an update as to what we’re doing right now. The first race for Strong Hearts Vegan Power this year will be the Ragnar Cape Cod on May 7-8. We will run from Hull to Provincetown, MA – covering 190 beautiful miles along the Cape Cod Coast. We decided to step it up a bit for this event – instead of 1 team of 12 vegan runners, we now have 3 teams. That’s right – 36 vegan runners from 9 states will be out on the course! This has obviously outgrown my ability to introduce them all to you in this blog, so we now have a website where you can meet the teammates! We have a great time when we join forces – teammates who share a passion for veganism, running, and let’s face it – the awesome vegan food. We love promoting our cause – we receive countless “GO VEGAN” cheers and comments from runners and spectators wherever we race. Many people come up to us to ask us about our diet & lifestyle, and we love to share. This has all been great – but we want to do more. In 2015 we are racing to raise money for and promote our teammate’s budding sanctuary, Tamerlaine Farm. 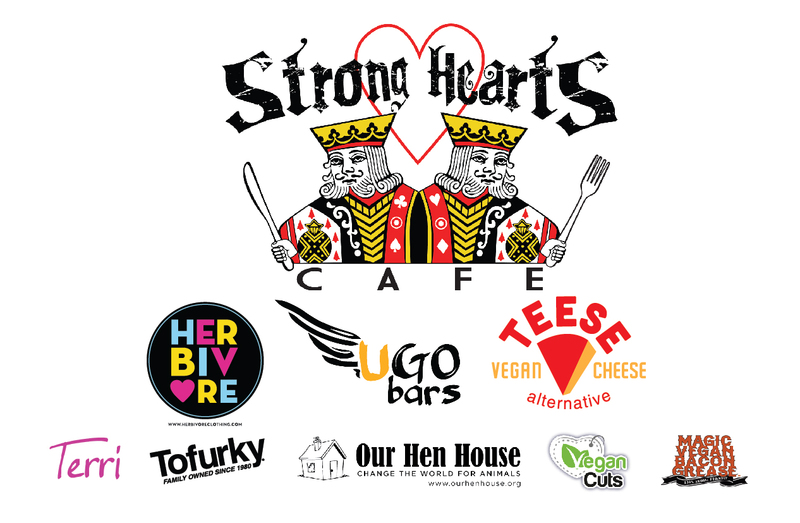 Peter Nussbaum joined the inaugural Strong Hearts Vegan Power team in 2013. 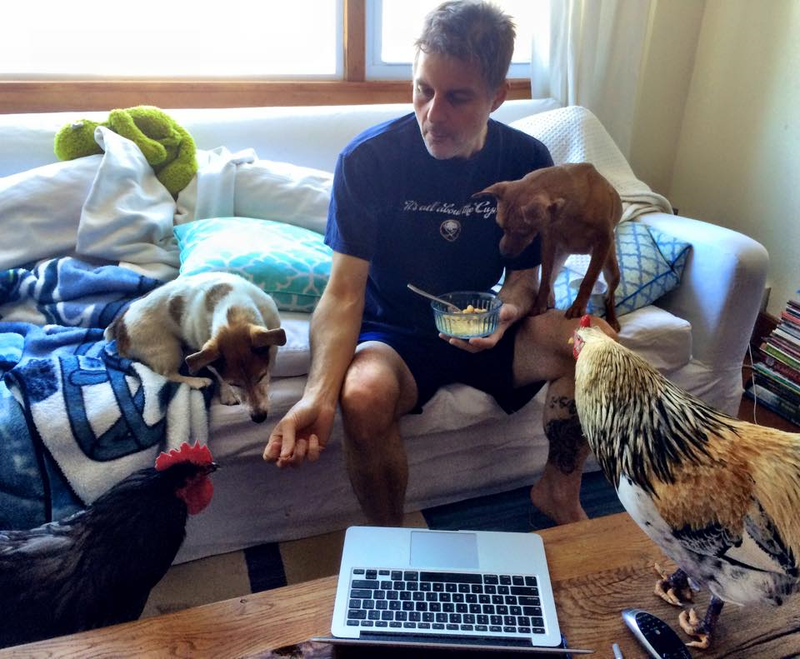 At that time he and his wife Gab (who was also the best personal Ragnar chef a team could ever dream of) had rescued 2 roosters, Yuri & Jupiter, followed by 19 ex-battery hens from CA who were about to be gassed. Their bodies are ravaged from the life they were forced to live in a factory farm, and they were lucky to have moved to the beautiful sanctuary where they could experience their first feel of grass and sunshine! 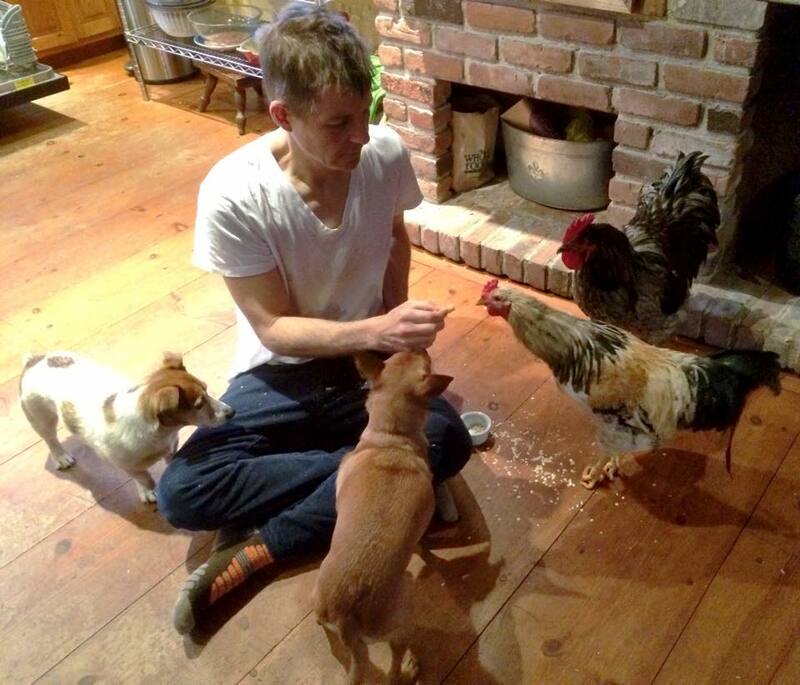 Tamerlaine Farm also has 2 other hens that were rescued from the streets of Brooklyn. Lisa, a brown layer hen was found under a car. She probably escaped from a live market or backyard operation. She is now doing great! “Brooklyn” was also found in an industrial part of Brooklyn. She lives with the kaporos boys and girls and is also doing great. Their latest addition is 19 chicks from a NYC public school hatching project gone bad. What does a school do with 19 chicks that hatched for a “project”? Throw them away. Luckily Tamerlane Farm was contacted and offered to provide a home for these sweet babies. They joined the growing flock when they were only 3 days old. They have been living inside through the winter and will move into their brand new barn once they are big enough. They have also adopted three additional roosters (roosters are generally harder to place) and they are happy to give them a good home. Learn more about what they do for the animals, what you can do to get involved and/or donate, and to look at some sweet pictures of beautiful feathered friends! Also new this year – thanks to the efforts of Scott Spitz we have some generous sponsors on board. Not only have the sponsors donated either funds or product to the team for the weekend, they also matched this with a monetary donation to Tamerlaine Farm. Chicago Vegan Foods – Dandies marshmallows, Temptation Ice Cream, Teese Cheese – need I say more?!? UGO Bars – handcrafted, fresh, vegan, gluten-free, non-GMO snack bars. Fuel for our runs! Herbivore Clothing – fashionable, witty, and ethically made animals-rights clothing. Also check out their online store for wallets, bags, books, jewelry, art, kitchen ware, and much more. Terri – more delicious and nutritious, organic vegan super foods with locations in NYC. Vegan Cuts – they find the very best vegan food, beauty and fashion products and send them to you through their online marketplace, monthly subscription boxes, and special edition boxes. Our Hen House – Using video, audio, interviews, reviews, and the written word, they provide daily updates on what you need to create change for animals. Magic Vegan Bacon Grease – Non-GMO, non-hydrogenated, cholesterol friendly vegan multi-tool for frying, cooking, or baking. Smoky, rich, bacony, and inexplicably vegan all at the same time. Tofurkey – a health, sustainable, passionate company producing tons of delicious meat-free alternatives. And yet there’s more! Our friends, who just so happen to have a very similar name, Strongest Hearts will be joining us in Cape Cod to conduct some interviews and film some of the awesomeness that will unfold. Check out their web series on vegan athletes and the resources they provide for vegan athlete nutrition. I can’t wait to meet all of my new teammates in May as we share and create new memories together. 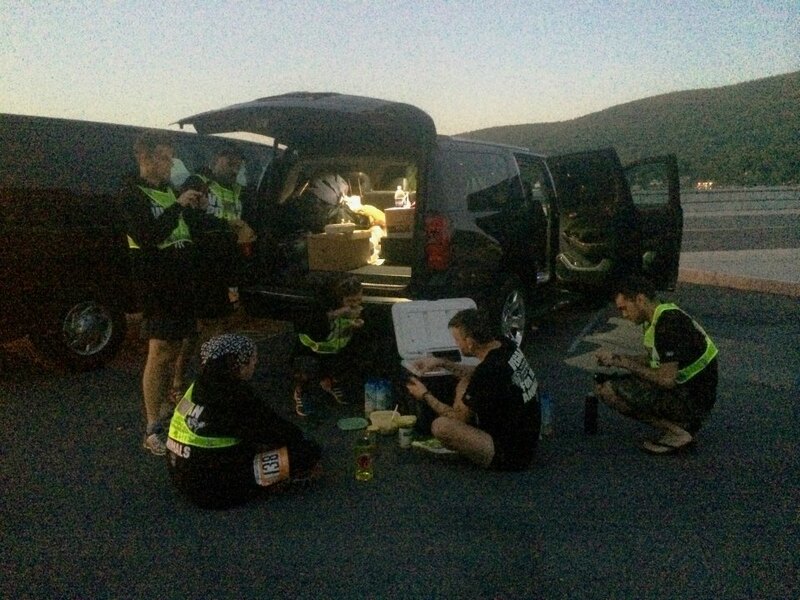 Each Ragnar event with Team Strong Hearts Vegan Power has been epic – this time it will be x3! We are still looking for a few dedicated van drivers. If you are vegan, enjoy driving endless hours without sleeping, maneuvering a large van around large groups of people, and enjoy the sweet smell of 6 sweaty runners – this job is for you! Oh there are more perks – you will laugh, you will cry, you will enjoy some delicious vegan foods, and you will be a part of something amazing all while making new friends. Oh, and you’ll even get a sweet hoodie! Cha-ching! Get in touch with me if you are interested. Otherwise, feel free to follow us on our adventure. We have our website, our new Facebook page, and we use #strongheartsrun to tag our pictures. We can’t wait to share our fun moments with you all! This entry was posted in Ragnar, Ragnar Cape Cod, Strong Hearts Vegan Power, Tamerlaine Farm and tagged Chicago Vegan Foods, Herbivore Clothing, Magic Vegan Bacon Grease, Our Hen House, racing, Ragnar, Ragnar Cape Cod, Strong Hearts Cafe, Strong Hearts Vegan Power, Strongest Hearts, strongheartsrun, Tamerlaine Farm, Terri, Tofurkey, tothefront, UGO Bars, Vegan Cuts, Vegan Power by lljkline. Bookmark the permalink. Awesome Awesome Awesome. Great write up here Laura. I can’t wait to meet you and everyone…it will be a truly boss time. I feel like I have big shoes to fill…hope that I can compete on the scale that is require for vegan-badassary. Can’t wait to meet you too! You’re going to fit right in don’t you worry – you’re one of us my friend! It’s great to see you are doing this. Sometime soon ….I may wish to participate. I have walked 25 mile stretches but have only run a maximum of five miles.I am vegan and pleased with that. Best of Luck !